During Thanksgiving week, I visited with relatives in New York City. On Wednesday night, we went to the Upper West Side where they inflate the balloon figures for the Macy's parade. While there, we visited the New York Historical Society Museum & Library which is right next to the balloon site. 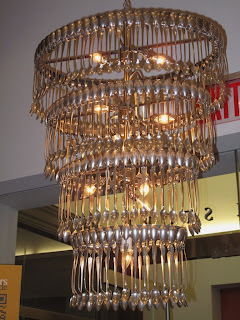 In the gift shop, there were several chandeliers hanging that are great examples of repurposing. 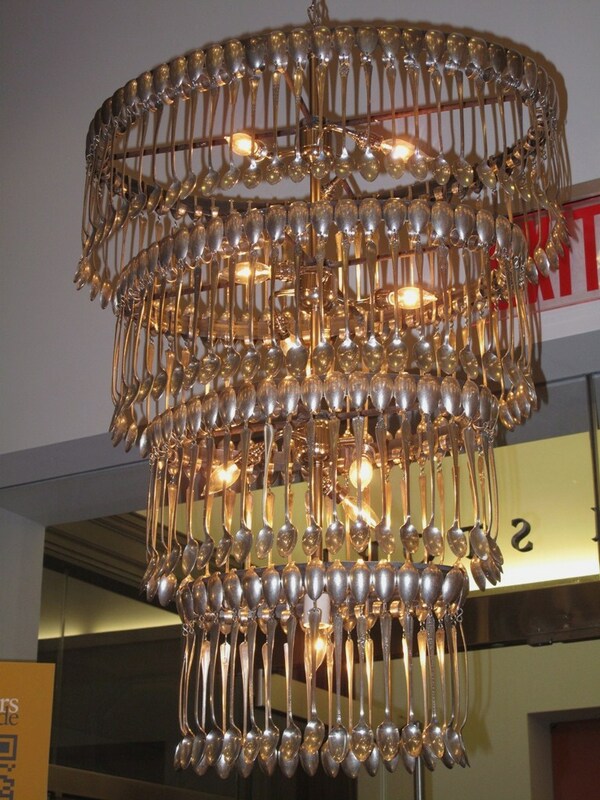 Been wondering what to do with those old silver plate trays and spoons? Now you know! Questions can be asked by posting a comment to any article like you did here. Or you can send an email. See "Email Silver Jim" in the right column near the top. does anyone know what a silver meat tray stamped viking silver V 3 A and a viking helmet mean?is it sterling or plate?any info would really help.thanks! I don't have much information on this mark. One reference ties "Viking" to Lipman-Levinter Industries of Toronto but I can't say for sure if that is correct for your tray. As a general rule, if it does not say "Sterling" on it, it is not made of sterling. There are exceptions but they are rare. Why would the manufacturer not mark it as sterling if it is sterling? So, my guess is silver plate. hi Jim, what does alpha plate mean? I am not sure about alpha plate. I've seen the term mentioned as meaning modern electroplate as opposed to older Sheffield plate process.